Get the Amazon Alexa voice assistant in your car with the new Anker Roav Viva car charger. The device is a two-port, high-speed USB charger with a microphone, Bluetooth and display built-in to enable Alexa when paired with your phone for control in the car and at home. The Roav Viva supports tens of thousands of existing Alexa skill, including reading news, weather and sports highlights and playing games (anyone for Jeopardy on your long road trip?). 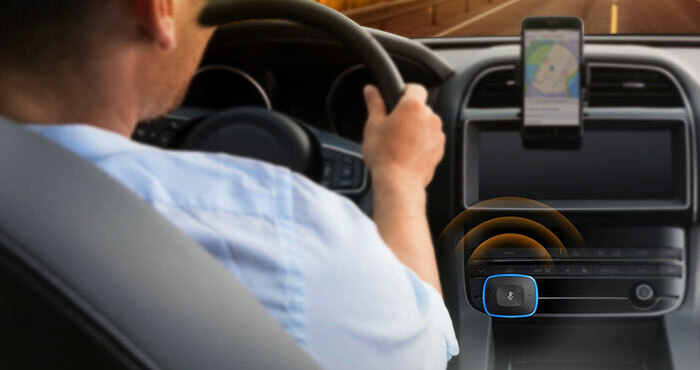 In your car, Alexa adds calling and messaging, music streaming and volume control, and voice navigation from Google Maps, Apple Maps or WAZE to get around that traffic jam you see ahead. For those who have a car with Bluetooth capabilities, the Viva will pair to play over the car system’s speakers. If you have an older car, you can still take advantage of the control and Alexa features as it also pairs with your phone. The Roav Viva can play music from Amazon Music, Pandora, iHeartRadio, Sirius XM and TuneIn (and will add Spotify early this year). Alexa on Roav Viva uses your phone for data connectivity to the cloud so it can communicate with your Alexa-enabled devices in your home. Turn on the porch lights or adjust the home temperature so it’s nice and toasty before you get home. Of, if you just found out you are having company, you can start your Roomba robot vac to do a little cleaning before you walk in the door. Then open the garage door with a voice command as you drive in the driveway. Now you can be productive even when you are stuck in traffic on the way home. Advanced voice isolation and noise cancellation with dual microphones makes it possible for the Roav Viva to hear your voice commands even when there is load road noise. Like other Alexa products, the Roav Viva lights up solid blue when it hears “Alexa” to indicate it is ready for a command. A pulsating green indicates there is an incoming call. The Roav Viva is available for pre-order on Amazon for $49.99 with an expected delivery in early February. Make sure to check for compatibility with your vehicle. Some cars may not have the clearance required for the device to plug in. Simply deliveries from prominent carrier business like https://australiapost.trackings.co By doing this he or she will certainly not just understand where.